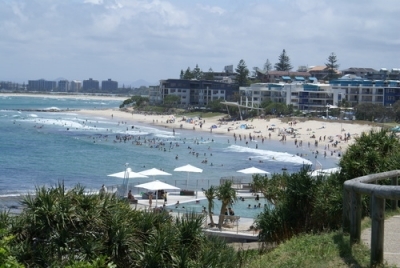 Caloundra is fast becoming recognised as one of Australia's fastest growing holiday destinations. Only an hour's drive North of Brisbane along the Bruce Highway, and only two hours drive north from the Gold Coast. Our Caloundra Accommodation will have you nestled in this great little township. The region stretches from the cool green of the hinterland mountains to the crisp blue and white of the beaches. With its greenery, near perfect climate, easy lifestyle and ideal conditions which prevail it is renowned as the most southerly resort on the Sunshine Coast. The subtropical Sunshine Coast averages seven hours of sunshine daily - one of the highest rating in the world. The residents and visitors can enjoy year round warm balmy temperatures. During summer temperatures range from 20C to 28C and winter temperatures range from between 10C and 20C.